Professor Levendis and David Laskowski working with the apparatus. Photo by Mary Knox Merrill. Student researchers at Northeastern University have designed an apparatus to convert plastic waste into clean energy without releasing harmful emissions. Under the leadership of Yiannis Levendis, distinguished professor of mechanical and industrial engineering, a team of undergraduate and graduate engineering students developed a waste combustor, which breaks down non-biodegradable plastics to create an alternative source of fuel. 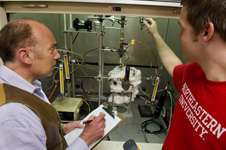 Their prototype was featured at the fifth annual MIT Energy Conference this past March. The team worked for nine months on the research, which, for the undergraduates, was their senior capstone project. “The prototype can be scaled up to drive a large power plant, which could connect to a plastic recycling center for a constant flow of fuel,” said David Laskowski, an undergraduate student working on the team. Levendis, who has pursued research on the combustion of plastics and other post-consumer wastes for the past 20 years, is currently focusing on the concept of vaporizing solid plastic waste, which would reduce levels of harmful emissions during the combustion process. According to Laskowski, calculations show that the new technology has the potential of replacing up to 462 million gallons of petroleum in the United States alone, if all recycled plastics were to be processed. “We are currently consuming highly-priced conventional premium fuels (to produce electricity). The fuel developed using this system will lower the cost of electricity for future generations,” Levendis said. The team members included Jeff Young, Shane McElroy, Jason Lee and Paul Conroy, all senior undergraduate students; and Brendan Hall and Chuanwei Zhuo, who are graduate students. With the success of their prototype, Hall and Zhuo plan to continue working with Levendis on further development of the project.